Plentiful sunshine. High 77F. Winds W at 5 to 10 mph.. Supporters of Meeting Street Schools’ public-private elementary school venture in North Charleston like to tout the open secrets of their academic success: Two teachers per classroom, longer school days and a culture of “grit” and determination. One other secret? They suspended more of their students than any other elementary school in Charleston County last school year. Meeting Street Elementary @Brentwood suspended one-quarter of its students at least once in the 2015-16 school year, including one-third of its black students. The figure is more surprising given Brentwood's student body: The school only served students in kindergarten through second grade that year. Just 5 percent of its suspensions were for physical violence or criminal offenses, according to the school district. Counties in South Carolina and other Southeastern states have some of the highest student suspension rates in the country, according to the U.S. Department of Education. Nationwide, black students are nearly four times as likely as their white classmates to be suspended. Lateise White was one of the Brentwood parents who balked last year when her daughter Destiny Fulton, a kindergartner, received a one-day suspension for a nonviolent offense. "I don’t think it was the right thing to do, and I only say that because she was only 5 at the time, and she doesn’t know any better," Fulton said. "At the same time, that is what the school does to get the kids in line, and it worked for my child." School officials at Brentwood said last year's suspension numbers may have been unusually high because Brentwood did not have an in-school suspension program, leaving out-of-school suspension as its only choice for handling some cases. They also said the average length of a suspension from their school, 1.23 days, is slightly less than at nearby elementary schools. Brentwood added an in-school suspension room this year, plus more student support staff. Charleston County School District Superintendent Gerrita Postlewait, who sits on the executive committee for Brentwood alongside officials from the private Meeting Street Schools, said she was aware of the suspension figures from last year and believed the school was turning it around. "I didn't deal with disciplinary data until late last spring. So we had heart-to-heart conversations with several principals. We talked about discipline with Meeting Street," she said. "I think the data are looking different this year." 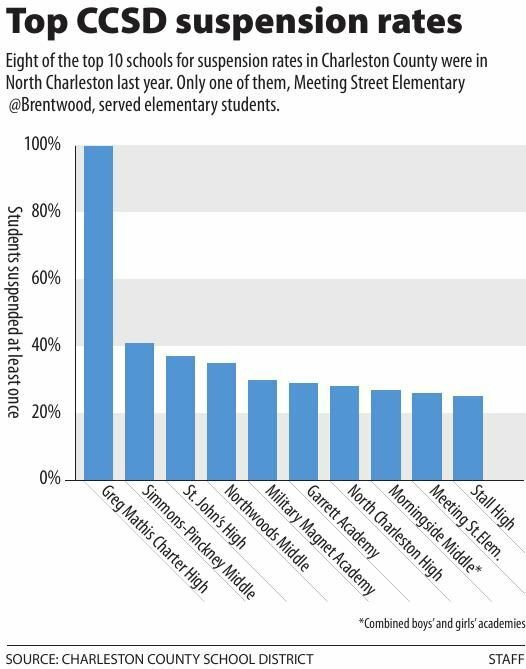 The suspension rate at Brentwood has fallen to 14 percent this school year as the school expanded to include third-graders, a rate more in line with other high-poverty elementary schools in North Charleston. Opened in the fall of 2014, Meeting Street Elementary @Brentwood is a unique partnership between the school district and Meeting Street Schools, a Charleston-based nonprofit group founded and funded by Sherman Financial Group CEO Benjamin Navarro. Navarro's group wowed some education leaders with its flagship Meeting Street Academy in downtown Charleston, a private school that got strong results with minority children from low-income families. When the group launched its first public-private partnership at Brentwood, it made some specific demands and got them: The principal has the power to hire and fire teachers at will, exercising a special exception to teacher employment protections under state law. The school also has the authority to set its own curriculum. Meeting Street Schools has since entered a second public-private partnership at North Charleston's Burns Elementary and a third in the Upstate with the opening of Meeting Street Academy - Spartanburg. Brentwood's student body of about 450 is three-quarters black. The school met a wave of skepticism when it opened in 2014, particularly among some black leaders. But NAACP Branch President Dot Scott later said that after touring the school and seeing the sky-high results on tests, including the standardized Measures of Academic Progress, she did a 180. “The only downside is we wish we had more schools like it," Scott said in 2016. The Rev. Chris Collins, a Charleston County School Board member from North Charleston, said he was disappointed to find out about the suspension rate at Brentwood, particularly with such young children. "This is ridiculous. This is the problem with partnerships right here," Collins said. "What I was afraid of was that we'd lose control and we wouldn't have any say-so. At this point, we really don't have any input whatsoever. It's basically private." Jon Hale, a College of Charleston associate professor of education and co-founder of the Quality Education Project, has been a frequent critic of Meeting Street Schools' approach in North Charleston, particularly its governance structure and hybrid private-public model. Hale said the suspension rate from last year is serious cause for concern, particularly as the school district seeks to reduce student suspensions and enforce its rules equitably for all students. "They were promoted as a better alternative, and people bought into that model, and, sure enough, we see that there's a lack of accountability, there's a need for oversight," he said. "When the district was trying to make improvements around discipline, schools like Brentwood were able to do what they want." One of Brentwood's new hires this school year is Virginia Crowley, a behavior interventionist who specializes in finding the causes behind bad behavior. Now when a student misbehaves, specialists like Crowley track the time of day, class subject and day of the week, looking for patterns to explain the root problems. "Of course, our goal is to keep our students in class as much as possible, and that’s always our goal," Crowley said. Principal Sarah Campbell came to Brentwood from KIPP, a high-performing network of public charter schools that has attracted some attention for its zero-tolerance approach to student discipline. Sometimes described by critics as "sweating the small stuff" or paternalistic, the schools' discipline plans can include harsh punishments for minor infractions. But Campbell, who has a habit of calling her students "kiddos" and can rarely be heard raising her voice in the halls, said her emphasis at Brentwood is on "positive school culture." She said she always abides by the school district's behavior policies, including the Progressive Discipline Plan that the district adopted this year. She also said that no parents have appealed any of the suspensions she's given. When students come back from suspension, she said she meets with parents or other family members, sometimes inviting them to shadow their child in classes for a day. One parent who shadowed her child after a suspension was Jennifer Rivers, whose son James Horry is in the first grade at Brentwood this year. She said that after a rough transition from pre-kindergarten and a few instances where he refused to do his work, the results she's seen in her son are "breathtaking." James was suspended in kindergarten when he disrupted class after refusing to do an assignment. Rivers said she had a good talk with her son that day. "I asked him once we got home and he sat down to talk, and he said, ‘I want to be there,'" Rivers said. "We were like ‘OK, it starts with you. Nobody else is doing these things to cause you to not be in school, so you need to sit down, listen, try to understand the work and do it. Don’t give up.'" Reach Paul Bowers at 843-937-5546 or twitter.com/paul_bowers.